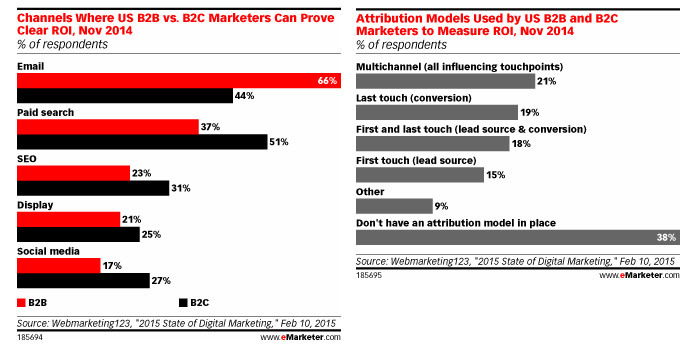 Which Media Channel Has The Best ROI? | ASTRALCOM - Content Strategy, Conversion Marketing and Customer Acquisition. The study indicated that social media was one of the “biggest pain points for respondents,” stating that, “While 87% of B2B marketers used social media, just 17% were able to prove its ROI—the lowest percentage among channels used.” On the B2C side, social media is the top channel, but with only 27% able to measure ROI. Check out eMarketer’s article to learn more. Or, just click or call us at 800.536.6637 – we’ll save you a lot of time and money because we already know which channels perform best for your industry.